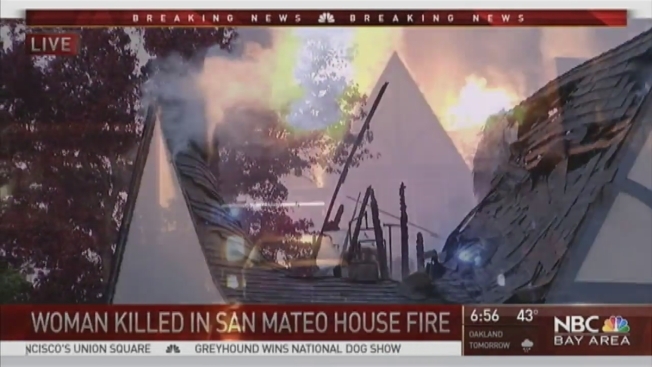 A woman in her 60s died Friday morning during a fatal three-alarm fire in San Mateo, firefighters said, in the same house where a man was killed by police about five years ago. Deputy Fire Chief Gary Hegwer said crews found the woman on the first floor of 1506 Oak Street, not breathing and responders couldn't revive her. Hegwer said the woman lived with someone else, but crews couldn't immediately find the second occupant. The cause of the fire is under investigation and officials are saying that the blaze is "suspicious." In 2011, a San Mateo police officer fatally shot Robert Caron, a schizophrenic man, at the same home after he had threatened a pharmacist with a pistol earlier that day, according to the San Mateo Times. The relationship between the woman and Caron were not immediately made public.